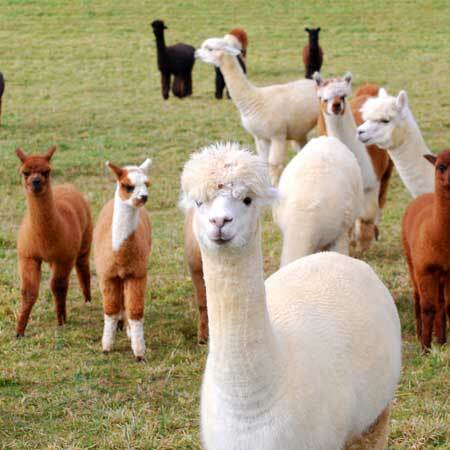 Alpaca fur is prized the world over by knitters and crocheters, artists, artisans and craftspeople. The animals come in 20 or more colours, everything from the deepest black to pure white, and the resulting wool is wonderfully soft and delicate. It doesn’t retain water and it’s surprisingly strong. In fact it’s the second strongest animal fibre in the world, second only to mohair. When do you how do you harvest the fur, and how do you do it? Shearing experts are thin on the ground in Britain, which is why some UK sheep farmers rely on Australian shearers to handle huge flocks in record time. As you can imagine, people experienced in shearing alpacas are in even shorter supply. Luckily the British Alpaca Society provides an extensive list of shearers, here. A good shearer will also clip your herd’s toenails and check their teeth for you. Like sheep, alpacas need to be sheared regularly to keep them happy and healthy, avoid overheating and infections from parasites. Shorter fur also lets you asses the animal’s overall condition more easily. It’s important to wait for the right weather conditions to prevent distress and discomfort. Imagine you wore a fur coat one day and your underwear the next – you’d feel the difference, and so do alpacas! In fact they can catch hypothermia if shorn in cold, wet, windy or changeable conditions. In this country they’re usually sheared once a year in late spring or early summer, which gives them time to grow a snug new coat before the winter sets in. It’s best to shear indoors, so you can control the temperature. Make sure to have blankets and bedding on hand in case they get chilly. Treat shearing injuries immediately so they don’t get infected, and keep your eyes open for flystrike, a painful and sometimes fatal infection caused by flies laying eggs on the animal, which hatch into maggots that eat their flesh. It isn’t common in alpacas because of their amazingly thick fur, but it’s worth watching out for just in case. Alpacas don’t really like having haircuts, so keep everything as calm and stress free as possible, with good lighting and clean pens. Your shearer will play an important part, putting in place good bio-security procedures including disinfecting the tools and equipment. Alpacas are sheared lying on their side. Two people lift the alpaca off its feet and lie it down carefully, either on the ground or higher up on a table, which is easier to reach. You need to tether the animal’s legs once it’s lying down. While the handler holds the head, the shearer takes the fleece off one side before rolling the creature gently over to shear the other half. It takes around six minutes per alpaca when done by an expert, and a fast shear goes a long way towards reducing the stress the animals experience. The resulting fleeces are gorgeous, super-warm and amazingly soft. You need to collect and store them carefully until you need them. Need to know more about shearing alpacas? If you’d like to ask an expert about alpaca shearing, we are always pleased to help. Feel free to contact us.